Here comes the black box a.k.a. the IR transmitter that is the other major part of GeForce 3D Vision. 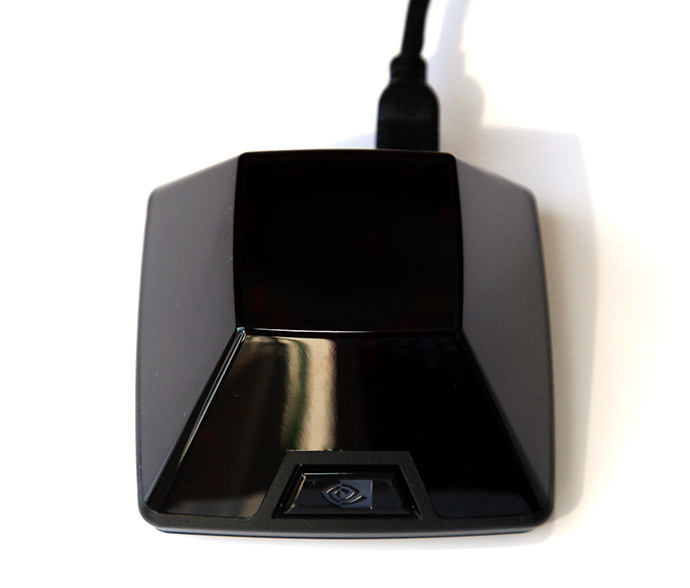 This small black box allows you to start and stop the 3D Stereo mode by just pressing the front button with nVidia’s logo on it. This device sends an infrared signal to the glasses that is being used to synchronize the image displayed on the screen and the shutters of the glasses so that each eye sees just half of the frames displayed on the monitor. On the back side of the transmitter you’ll find a mini USB connector that is used to connect the device to the computer, along with the scroll wheel used to set the level of depth when you tun on a 3D stereo mode. The scroll wheel is very convenient, because you can change the depth in every 3D application when you turn the 3D Stereo mode in real time. The level of depth is also controllable from the Stereo Drivers, but you need to go to the control panel of the video drivers in order to be able to modify it (the default value is 15%). 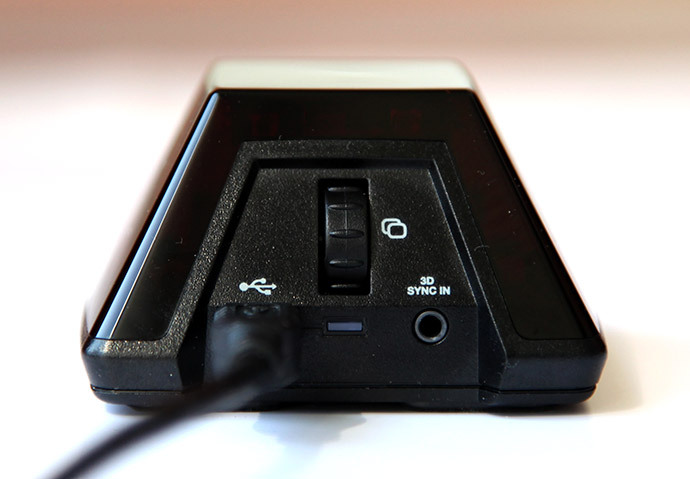 The connector on the right you see is only needed for synchronization when using a compatible DLP TV set as a display in combination with GeForce 3D Vision. And now for the fun part. The image above is shot in infrared mode and thus the camera actually sees below the normally visible as black external surface of the transmitter. 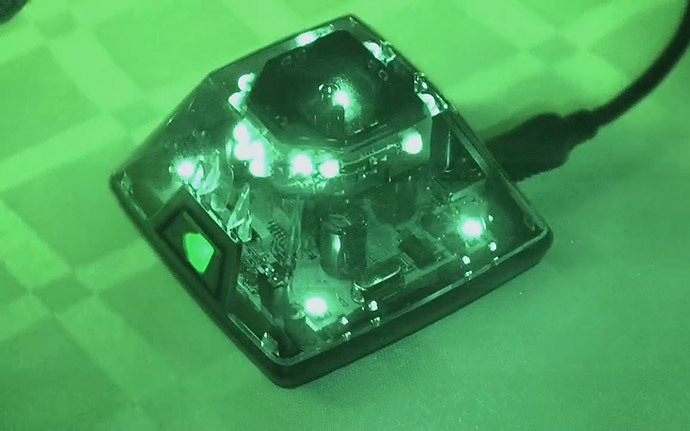 This is possible, because the cover of the transmitter has been made from a special type of plastic that blocks only visible light (appearing black in color), but at the same time passes all infrared (IR) light. This is done, because the transmitter sends infrared signals to the glasses and this type of light rays needs to pass through the external walls of the device. And all the bright lights you see inside the transmitter are actually infrared LEDs that are used to send the synchronization signal to the glasses. As you can see they are placed all over the inside of the transmitter which is needed to provide the best “connection” between the glasses and the transmitter, because infrared light transmission requires direct line of sight. With this design you don’t need to place the transmitter in a special location to get the best results, you can simply place it somewhere around the monitor and everything should be fine. Just be wary of some other devices transmitting infrared signals that may be active around you and the computer, because that might bring some interferences and break the synchronization of the glasses and the transmitter.